J. Unwin Plumbing & Heating are delighted that our plumbing apprentice, Myles, has been working hard at Leicester College and has already undertaken his first year. How time flies when you’re having fun!! 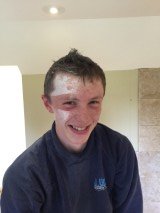 Myles, after removing his safety goggles whilsts cutting tiles.